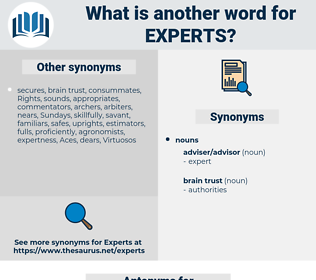 What is another word for experts? 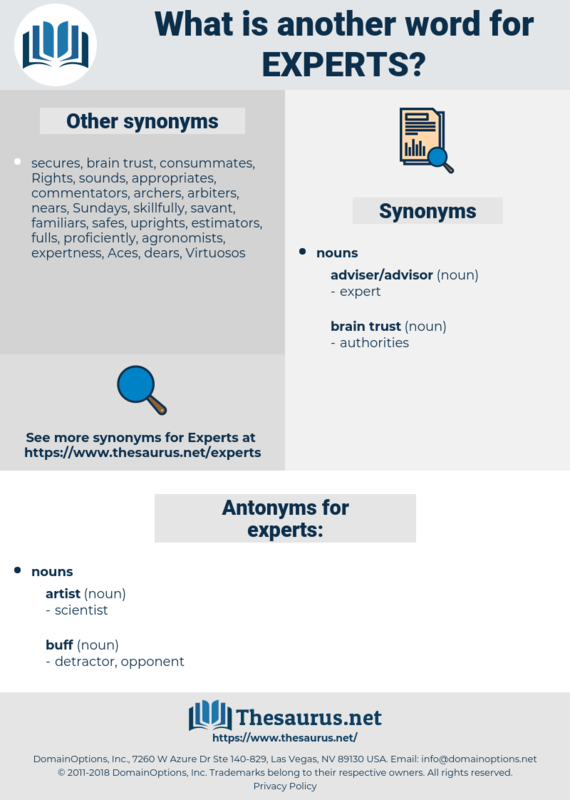 expertises, Investigators, commentators, meteorologists, technicians, examiners, analysts, advisers, jurists, counsellors, observers, reviewers, old-timers, Specialists. representatives, aspects, Canadians, states, nations, fellows. under-secretary-general, international, panellists, certified, directive, ministers, technology, world, knowledge, fellows, europe, tajikistan, police, TOS, chair, head, june, SP, office, CSL, IPC, april. representatives, exports, report, Researchers, archaeologists, specialized, scientists, historians, professionalism, executives, explanations, participants, Physicians, Recommendations, techniques, educators, counterparts, experience, experiences, planners, competences, writers, practices, educationalists, instructors, critics, advisors, appraisers, trainers, responsibilities, professions, Lawyers, partnerships, Personalities, Organizations, engineers, presentations, competencies, marketers, evaluators, Specialties, proceedings, peers, legislators, secretariat, authors, provisions, forensics, assessors, Respondents, groups, interveners, stakeholders, masters, watchers, providers, doctors, discussants, reparations, Scholarships, clinicians, expenses, technologies, contributions, Resources, colleagues, Efforts, seminars, workers, procedures, personnel, speakers, relevant, cooperation, delegates, terms, managers, parts, witnesses, Capabilities, matters, institutions, delegations, sponsors, agents, references, candidatures, disciplines, officials, components, skills, outcomes, candidates, applicants, obstacles, auditors, referees, academics, Luminaries, Analyses, sources, councillors, sessions, pros, Agencies, Standards, players, Areas, pundits, opinions, commitments, trade, sectors, adjusters, markets, services, Forums, Talents, members, Communities, barriers, discussions, item, items, behaviours, monitors, points, Studies, Measures, actors, conclusions, fields, issues, development, developments, leaderships, problems, Charges, questions, TECHS, powers, tanks, offenders, affairs, applications, nominations, costs, holders, individuals, Parties, leaders, ways, frameworks, works, covered, organic, places, CSLS, sages, boffins, model, UNCTAD, campaigns, spaces, decisions, states, elders, economic, Fees, minds, Countries, circles, Territories, changes, 1998, numbers, 2003, figures, awards, views, Activities, 2009, 2002, actions, have, men, 2004, flows, meetings, goods, panellists, fellows. presented, experienced, selected, invited, trained, established, placed, involved, conducted, drawn, covered. But we note with pleasure that you propose to have the " essential points" of our digest " boiled down" by one of the business experts of your office. The answer will be: Because the modern experts are familiar with theatrical effects of a kind Shakespeare never lived to see. exasperate, expired, egbert, export duty, eggfruit, exasperated, Exuberate, export, esprit.